Two days after a report that Tony Romo is out for the remainder of the season set off a firestorm, the same source is reporting that the Cowboys’ quarterback on defense will miss Sunday’s all-or-nothing game. 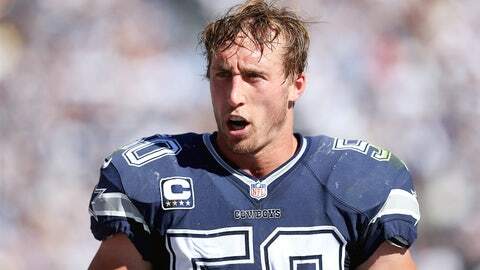 ESPN’s Adam Schefter reported late Wednesday that Dallas starting middle linebacker Sean Lee has been ruled out for Week 17’s game vs. the Eagles with a sprained neck. Lee suffered the injury vs. Chicago on Dec. 9 and has missed the past two weeks because of it. Lee also missed two games last month with a hamstring injury. On Monday, after Schefter reported that Romo would be out for the season with a back injury, the team and head coach Jason Garrett refuted the report, insisting their QB was day to day. Later in the day, FOX NFL Sunday’s Jay Glazer reported that Romo had a herniated disk, but that his status for Sunday’s game which will decide the NFC East champion is up in the air. The loser of the game will miss the playoffs. Earlier Wednesday, the Cowboys finalized a deal with 41-yerar-old Jon Kitna to back up Kyle Orton. Orton and Romo were the only QBs on the team’s roster; Orton is expected to start should Romo be unable to go. Kitna last played in 2011, his final of three seasons in Dallas.